This year, the cinematic prowess of Asian Pacific American cinema at Sundance 2013 is nested in a quartet of documentary features that are making their debuts this week. One, Kaylanee Mam’s elegiac and haunting A RIVER CHANGES COURSE, comes with award-winning pedigree: director Mam, who traded in a career as a lawyer to pursue filmmaking, served as the cinematographer, associate producer, and researcher for the 2011 Academy Award-winning INSIDE JOB. Indeed, director Mam’s camerawork is on stunning display here, capturing a community and a way of life slowly being changed by rapid development in her native Cambodia. Centering on three young Cambodians whose way of life, and that of their families and many like them hinges on the lush rivers and dense jungles that pulse through the country, the film maintains a deliberate, steady pace as a story of change takes place within its taut 83-minutes: forests have been cleared to harvest lumber with no strategy for replacing the trees; land becomes scarce and costly, and the rivers that yield bounties of fish become less plentiful. 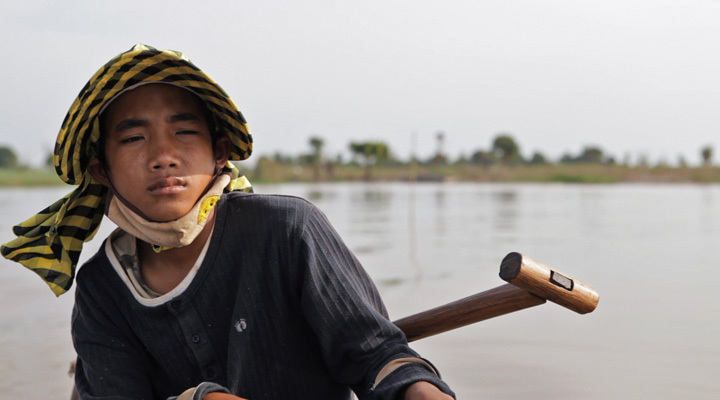 The changes observed in A RIVER CHANGES COURSE gives way to a harsh reality: to survive, family members leave behind their way of living for the factories of Phnom Penh, straining an already threatened community structure. The changes observed in director Mam’s film are heartbreaking, yet told with incredible filmmaking style that is as observant as it is respectful. The story may not be a new one (see: China, Peoples Republic of; South Korea; India; Thailand; and many other Asian nations forced to make difficult choices for their peoples in the name of development and “progress”), but in Kaylanee Mam’s hands, is as refreshing and lovingly observed as it is shocking. Considerably more familiar (to this writer) though no less masterful is ANITA, the latest feature-length documentary by prolific Angeleno Freida Lee Mock. Taking as her subject the Oklahoma born-and-bred contract law professor Anita Hill, ANITA takes as its narrative the whole sordid and embarrassing chapter of American politics when in 1991, Hill accused her former boss, then-Supreme Court nominee Clarence Thomas of sexual misconduct and lewd workplace behavior. Her testimonial, in front of an exclusively white, male Senate Judiciary Committee to testify against Thomas, dominates the first half of the film, not unlike another of director Mock’s award-winning productions: 1994’s Academy Award-winning MAYA LIN: A STRONG, CLEAR VISION. As in that earlier film, the sensationalistic story at the core of ANITA drives the story, and for those not familiar with the race-baiting, idealogical politic-speak, and —let’s face, it because in looking at the footage used in the film it’s so obvious — addle-headed sexism of a male-dominated Senate, the outcome, while infuriating, is all but inevitable. It is here that ANITA shifts course and becomes a completely different animal. Just as in MAYA LIN, where the controversy of the Vietnam War Memorial brouhaha and its denouement gives way to a necessary examination of Maya Lin and the forces that drive the development of her artistic aesthetic, so too does ANITA dispense with overwrought analysis of the Clarence Thomas controversy and instead profiles Anita Hill’s growth as an educator, role model, family and community member, and daughter in the subsequent years. Opining that her ordeal was not strictly a case of sexual harassment but part of a much broader issue of gender equality, Hill’s legacy has been evidenced in her ability to put that chapter of her life in the past and move forward and embrace a fuller and more rewarding identity. In contrast with the career path of Thomas — who dismissively is mentioned as having won nomination as a Supreme Court Justice and, it must be assumed from the film’s ability to excise him from the last twenty years of Hill’s life and professional career, is currently serving a decidedly undistinguished and inconsequential tenure — Hill’s life has been distinguished by career challenges and triumphs, as well as an ongoing legacy for newer generations of young women to follow. During the Q&A following the screening, Professor Hill’s curt replies to queries as to whether Justice Thomas has contacted her in the years since the controversy — “No” — drew knowing laughs, giving way to a discussion of her legacy and to director Mock’s skillful directorial job. My thinking is that ANITA is destined for a broader audience via public television and all the usual theatrical outlets, a fitting destination for such a well-told and timely profile in courage.